In the past I’ve made light of board games that come in a box resembling one from Domino’s Pizza. I even went as far as to ask whether a good game could really be expected when corners were cut. Planetary Strike was self-published and we forgave the minimalist packaging and tackled the actual game head-on. Then shortly after we played another self-published game, Universe, which also came in the same style box. Neither game was a ‘dud’, but certainly lacked the polish and charm of being provided in a real game box. Recently another pizza-box game hit our doorstep. Only this time it wasn’t from a one-man-show publisher, it was the latest game title from Bezier Games. 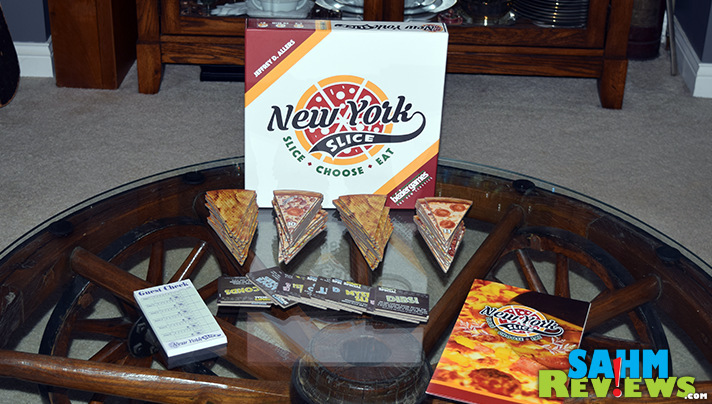 Known for their fantastic line of trivia games, Colony (our current favorite dice game) and the ever-classic One Night Ultimate Werewolf series, New York Slice‘s packaging wasn’t the result of cost-cutting. It was the perfect choice for a pizza-themed board game! 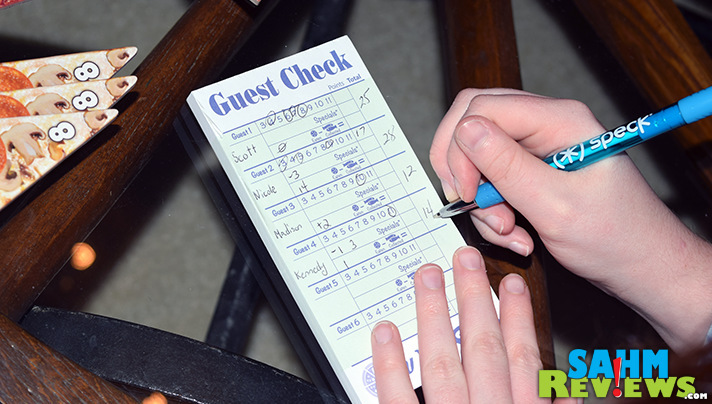 In fact, not only is the heavy-duty box designed to resemble a one-piece pizza box, the rules are laid out like a typical pie menu and even the included score pad resembles a waitress’ guest check pad! New York Slice takes on the old routine of deciding who gets what pizza. This brings back memories of the kids fighting over a single slice because one had more pieces of pepperoni on it. Wait…that was just last week. Included in New York Slice are 69 pieces of pizza, printed on extra-thick board (thicker than some thin crust pizzas!). These are randomly shuffled and put in stacks of 11 slices, face down, with the remaining three being returned to the box. 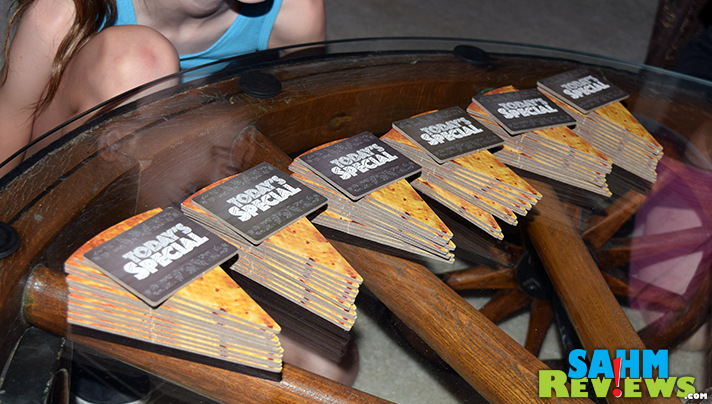 A separate stack of “Today’s Specials” cards are also shuffled and one placed on each stack of slices. 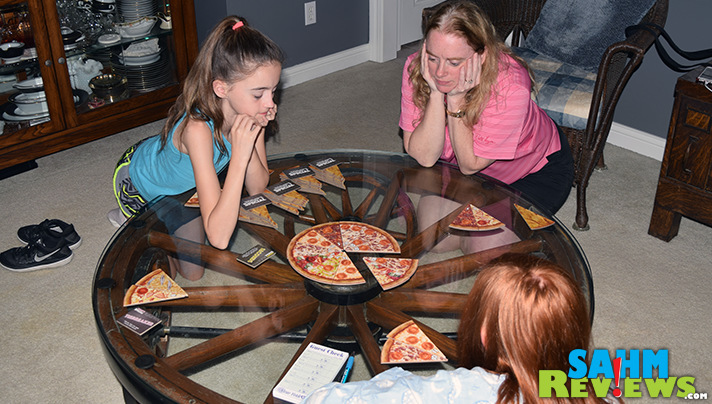 The first player chooses one stack, turns over and reads aloud Today’s Special and proceeds to construct the pizza by flipping the slices and arranging them in a circle. The slices are kept in order as drawn, and 11 slices will form the entire pie. I don’t know about you, but when I was little my mom had a routine of how my brother and I would split things. We’d usually argue over a candy bar or a slice of pie, so mom’s rule was that one of us would split the item and the other would choose first. 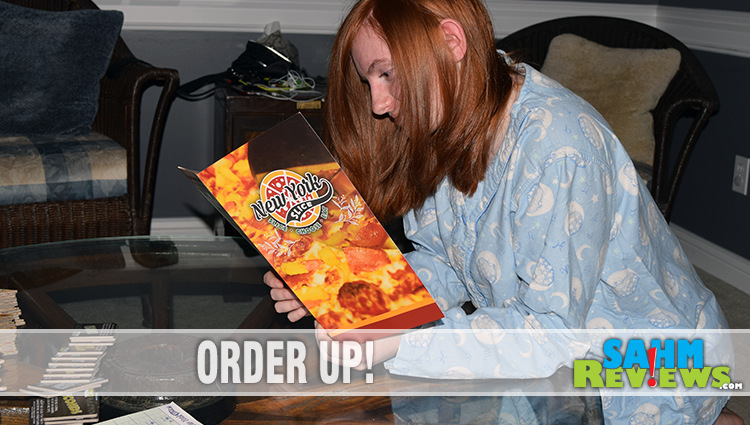 That’s exactly how New York Slice is played! 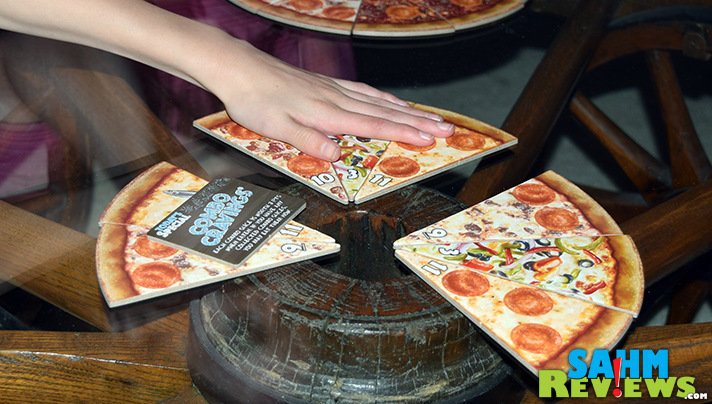 The active player splits the pizza into portions equal to the number of players. They cannot move the slices around – they must keep them in the same positions relative to each other and divide the pizza into what they feel are equal portions. Unfortunately not all slices are created equally! Some are rarer and others might give you additional points at the end. The Today’s Special card is also in play and set on one of the portions, sweetening the deal for whomever chooses it. Once the active player is happy with the split, the next player selects a portion, then the next, and so on until it comes back around to the active player, who receives the last pieces. As you might have guessed, New York Slice is all about set collection. Each pizza type, from vegetable through cheese, awards points to whomever has the most slices of that type on their plate. Anchovies on your pizza are negative points, but can be abated by eating the pepperoni off your slices as you win them. Supreme pizza slices act as wilds since they have all the ingredients on them, and Today’s Special will also award points or allow special actions unavailable to other players. The player with the most points wins! (and pays the check)! 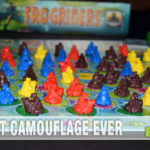 We found New York Slice to be a wonderful solution when looking for a game to introduce new players to the world of hobby gaming. 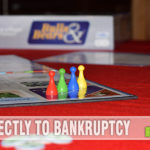 Supporting up to six players and bringing back memories of fighting over the last chocolate chip cookie, it is well worth the under $30 price on Amazon. While rated for ages 8+, I would not hesitate to include younger members of the family. All kids love pizza! 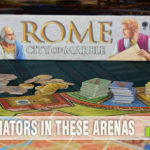 If you’re a fan of Bezier Games‘ hit game, The Castles of Mad King Ludwig, you need to be sure you’re following them on Twitter and Facebook. They have a sequel in the works called “The Palace of Mad King Ludwig” that is rumored to replace the castle version on your game shelf. Hungry now? Enter to win a copy for yourself by using the form below! 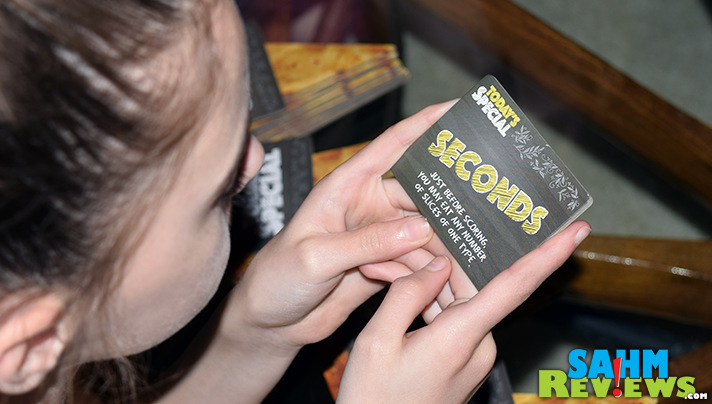 Don’t forget – you can come back daily for more entry opportunities! 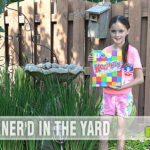 Do You Run and Hide When Asked to Play a Trivia Game? We have a really good Little Caesar’s Pizza near us. Not many options, but I love their white garlic sauce and just get cheese on it. If they had more toppings, I’d add mushrooms and olives, my favorites! When in MD you always go to Ledos! We always have pepperoni and cheese on our pizza. The best pizza close to me is Pomodoro’s. My preferred toppings are mushrooms, onions, and fresh garlic (the latter of which they sadly don’t have there). The Noah’s Ark Special. Two of every animal! My go-to pizza brand is Dominos. I’m not picky about brand, but I want black olives on my pizza at all times. I get pizza from a local place. It has feta cheese, mozzarella, tomatoes, spinach and garlic. Local place which turns a Gyro into a delicious pizza. Favourite pizza is Garlic prawn, avocado and feta. I love pepperoni, sausage, olives and pineapple pizza! Ham And Pineapple from Papa Johns!!! Just discovered that I need salami on my pizza. Out of this world! I love a pizza with TRIPLE anchovies. Unfortunately, this isn’t a very popular pizza choice so I don’t get to order it very often at all. We love a local pizzeria here in PA called Paese Mio! And my go-to toppings are pepperoni & black olive! I used to love Hawaiian BBQ Chicken, but in the last few years I had to go Gluten and Dairy free… so real pizza is a thing of the past – now I can only get Daiya brand, but the Supreme is tolerable. I like pepperoni pizza…or chicken pesto if I’m trying to be fancy! We have a local pizza place with a drive-thru that my husband likes to swing by on his way home from work… favorite added topping is their “meat sauce” which is red sauce with cut up meatballs in it, the same as they use in their meatball subs. I like a little bit of pizza with my cheese! Nothing else just extra EXTRA cheese!! My go-to pizza is a Digiorno cheese pizza, to which I add my own toppings. Usually mushroom, onion and olives. But Dewey’s Pizza has some awesome flavor combos, too. My go-to pie is from a local place (Mamma’s)–pepperoni and onion. Classic! I love my local small business pizza places. But being from Illinois, I love a good deep dish pizza. I like Papa john’s because of the garlic butter it comes with. And I prefer traditional crust with pepperoni and jalapeño. My go-to pizza toppings are pepperoni, green peppers and mushrooms. New York style, plain cheese! My favorite pizza is pepperoni and sausage. My favorite is a Domino’s Pizza with Extra Cheese, Pepperoni and Green Peppers. I love pepperoni, pepperoni, and more pepperoni, but a little sausage.